The Israel Wine Institute was founded in 1957 to improve the quality of Israelis wines and further their export. Its Board of Directors comprises wine producers and representatives of the ministries of agriculture, industry and trade, and finance. Research activities are generally undertaken in cooperation with scientist from the Faculty of Agriculture at the Hebrew University of Jerusalem and from the Agricultural Research Organization (Volcani Institute). A committee under the auspices of the Ministry of Agriculture regulates vineyard activity. Cuttings for new varieties are usually obtained from France, on American rootstock, and propagated in Israel. - In Judaism grape personifies pleasure and prosperity. In TANAH a grape bush is often compared with the Eretz Israel. The words "grapes", "vineyard", "wine", "grape juice", "vine" are used there as often as the name of God. The Bible sources assert that Noah, rescued from the Great Flood, became the first man who planted vineyard and prepared wine. Bread and wine are blessed in the grace. But on the ground of ancient Israel they had known the taste of wine two thousand years earlier than the first vine appeared in Europe . Our ancestors learned to look after vineyards carefully and laboriously. They planted the vineyards on the slopes of mountains, hoed and weeded the ground annually and watched the right direction of the growing vine. To prevent from the ground slipping they stacked terraces of stones. And when it was, the time to gather crops they turned the harvest into the real feast. There are certificates proving that the weight of a grape bunch reached 5 kg. However, different religions have different attitude to wine. The abstinence from alcohol drinks is one of the basic requirements of Islam. Therefore, when in the V П century Arab tribes came on the ground of Palestine the development of the vine-growing was impeded and then completely stopped. And only at the end of the XIX century when Zionists reached up to the Eretz Israel they began its revival from planting vineyards. - Did the first settlers of Rehovot, where your Institute is situated, also begin the development of the agriculture with vine-growing? - The marshy ground of Rehovot appeared to be of little use for vineyards. Hard work was done to cultivate the ground for bringing up vine. But the harvest was poor. As we know from a history the town of Rehovot became the centre of citrus cultivation. But in the neighborhood, in Rishon-le-Zion, persistence and work of vine-growers resulted in significant success. As a matter of fact it was baron Rothshild who brought great contribution in the success. He sent skilled experts - vine-growers to Rishon-le-Zion. They brought same new kinds of grapes such as cabernet, sauvignon, carignan in Palestine from Bordeaux and owing to the proper care these new sorts took roots perfectly well on the ground of Rishon-le-Zion, Zihron-Yakov and in area of a Mount Carmel . The French experience helped the Jews to open for themselves the complex science of winemaking and use its achievement successfully on their ground. The crops were so generous that in 1887 baron Rothshild took the decision on construction of the first wine factory in Rishon-le-Zion. The bottles with Jewish wine made on the Holy Land were issued in two years. The factory in Rishon-le-Zion was that time the third on the size in the world! And wine Carmel from Palestine awarded a gold medal at the world exhibition in Paris in 1900. - And was it the time when the Jewish wine was first issued on the world market? 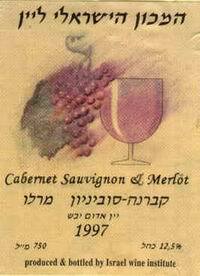 - The Jewish winemakers produced only kosher wines. Practically it meant that only the religious Jews were engaged in the production process and, of course, they used only kosher industrial materials. The so-called law "shnat-shmit" (thrown year) i.e. the interdiction to gather crops during each seventh year was strictly observed. The Kosher wine was in demand in all Jewish communities all over the world. And even Christians were not indifferent to it, perceiving it as a symbol of the Holy Land . So our manufacturers hade been resting on laurels for almost half a century. But as it is well known the absence of a competition in the market doesn't result in good. And so it happened. The winemaking in the world has stepped far forward, and Israel couldn't offer its consumers anything but sweet red wine, which was drink on Saturdays or on religious holidays. They started talking about serious lag in winemaking in the beginning 60-s of the last century. But the years had past when this branch of the Israeli economy was put on the proper level. And our Institute brought the weighty contribution in this business. - When was the Wine Institute based? - The Wine Institute was based by the Ministry of Industry in 1957. Since then its status hasn't changed: we are the state company that has to carry out the precise tasks. First, it is improvement of the wine quality and its competitiveness. Secondly, it is education of the consumption wine culture among the population. You see, in Israel it was considered that wine accompanies only religious traditions. Of course, after the State Israel had been formed the approach to the winemaking became more serious. They began water and soil exploration and carried out the selection work. However, all the accumulated information didn't get any serious expert estimation. The experts of our institute began thorough study of the world experience. If the earlier efforts of the vine-growers were directed only to increasing of the productivity, the modern scientists understood that the circle of the requirements should be considerably extended. You know there are a lot of factors that influence the wine qualities. And first of all it is climate. If the Europeans are concerned most of all with ripening of the grapes in time, our problem is quite opposite. Certainly, owing to high average annual temperature and absence of frosts a vine develops well and the grapes are always become ripened. Sated, joyful for eyes color of Israeli wine is also resulted from the abundance of the sun. But in the warm areas of the country grapes ripen so quickly that the balance of acidity in them is broken. The taste of wine made of such grapes is plain, primitive and there is no aroma in it. So the climate in Israel is by no means ideal for winemaking as it could seem at the first sight. The experts are compelled to look for the ways of restraining the grape ripening process. The monitoring of weather conditions is being constantly conducted. In the cooler climate, when there is considerable difference in the round-the-clock temperatures, grapes ripen gradually. Such conditions are guaranteed by the presence of the mountain-mass in the area. The Institute examines features of every sort, taking into account such factors, as grapes quantity on a bush, weight of a bunch of grapes, strength of a stem and foliage state. Approximately a month before the beginning of the crops our experts make chemical analyses. Basing on the results of these analyses we determine the precise date of the harvest. I pay your attention to the fact that it is a question of the precise date because the delay even for 2-3 days will subsequently affect the quality of a wine. - How do you evaluate the competitiveness of Israeli wines? - Our efforts on develop winemaking are not in vain. During two last decades the enormous jerk has been done. We have managed to prove ourselves on the world market. The last year crop was one of the best for the whole history of the Israeli winemaking - 50.000 tons, and it is approximately 50 millions bottles. In the autumn of 2004, in the sixth fair of the Israeli wines, 40 big and small wineries took part presenting about 200 wine brands. A part of them appeared in the market for the first time. The winemakers are the people who fell in love with their trade and their land. The wine for them – is a work of art. And they strive to surprise the connoisseurs wine with its beauty and uniqueness and to expose the individual features of the native vineyard. We have the precise classification of wines according to the regions, and this classification is recognized by the European Union. The experts note, that Israeli wines are finely balanced, they are notable for gentle taste, refined aroma and sated color. All these qualities have let tiny Israel to stand near by such wizards of winemaking as France , Spain , Italy , Australia and USA . We cooperate not only with Israeli winemakers. The Institute is engaged in the control and standardization of imported wines and all alcoholic drinks, including vodka, and there are more than 300 kinds of it. We work in the close contact with Institutes of our type all over the world; and we are the members of the World Wine Community, which includes 70 countries. The students of the agricultural faculty of the Jewish University situated in Rechovot pass training in our Institute. I also crossed its threshold, when a student. And today I am proud of the fact that our Institute can serve as an example of the successful integration of the specialists came from the different countries. The immigrants from Italy , France , Ukraine , Russia , Moldova , Georgia , countries of Latin America work together with the native Israelis. Many of them have brought with the necessary know-how from the winemaking enterprises of their countries. So wine unites the people, fills our life with pleasure, gives us optimism and good mood.